A ko which is so large that any ko threat on the board must be ignored, since losing the ko means losing the game. The Japanese, tenka-kikazu (or tenka-ko), means literally "there is no threat under the sun". From Nihon Ki-in, Shin Hayawakari Yougo Shojiten: "Tenka-ko: a ko so large as to determine the outcome of the game (shoubu ga kimatte shimau). A ko that, no matter where the other side plays a ko threat, if resolved yields victory (kachi ni naru)." A game deciding ko can be one-sided, where winning the ko does not win one player the game, but losing it definitely loses him the game. It can also be two-sided, where whoever wins the ko wins the game. Examples of the second case are not generally found in professional play, as professional players will see the ko coming many moves in advance, and can read ahead who takes it first (and therefore wins). Thus they will resign before the ko ever appears. 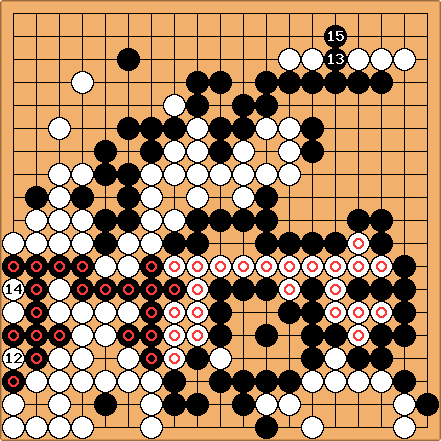 In this game from the preliminaries for the 47th Oza, the ko in the lower left is the result of a semeai between the marked groups and is decisive for their fate. White takes the ko first on move 212. The professional commentary by Go World said: The ko is tenka-ko, that is, so big that White has to ignore all ko threats. The successive moves of 213 and 215 give Black a very slight lead. Both sides play the endgame with precision. As it turns out, Black wins the game despite losing the enormous ko fight. Black wins by 1/2 point. A full commentary of this game can be found in Go World issue 86 (Autumn 1999).